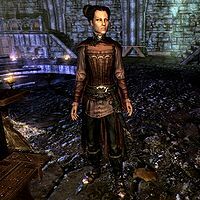 Valerica is a Nord vampire, wife to Lord Harkon and mother of Serana. She is found just outside the entrance of the Boneyard in the Soul Cairn when you go looking for her to find an Elder Scroll to be used by Lord Harkon. She does not have a very good relationship with her daughter because she hid her away from Lord Harkon for many years to keep him from retrieving her blood, which is needed for the ritual to block out the sun, despite the fact that Harkon is still unaware of that part of the prophecy. She also holds one of the Elder Scrolls needed for the prophecy. She is initially very disdainful and untrusting of the player, regardless of which side the player chose. She eventually realizes her error in judgement with Serana after a heated argument between the two, after which she has a bettered relationship with you and Serana, but is still somewhat unsure of your motives for awhile. After Harkon is defeated, if you return to the Soul Cairn and tell her so, she will return to Volkihar and take up residence in her study, telling you "Ah, it's good to be home again". At the same time, she will replant her garden in the courtyard. You may ask her to make Bloodcursed elven arrows for you, but she will refuse politely. After completing Beyond Death and leaving the Soul Cairn, if you return and talk to Valerica, she can be asked to turn 5 Soul Husks into a Soul Husk Extract. She no longer offers this option after relocating to her study in Castle Volkihar. Valerica wears a unique set of vampire royal armor with a pair of vampire boots. She is equipped with a ring of regeneration, a necklace of frost suppression, and an ebony dagger. Beyond Death‎: Search for Valerica in the Soul Cairn.